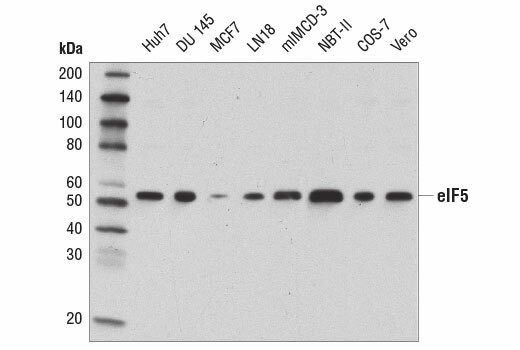 Western blot analysis of extracts from various cell lines using eIF5 (D5G9) Rabbit mAb. 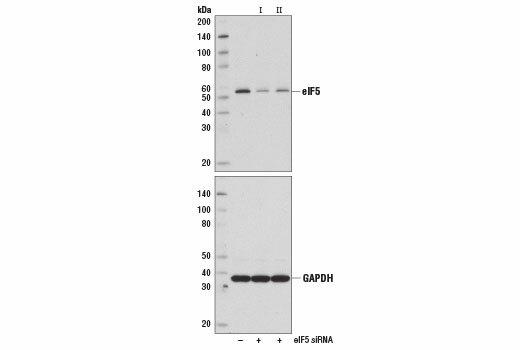 Western blot analysis of extracts from Huh7 cells, transfected with 100 nM SignalSilence® Control siRNA (Unconjugated) #6568 (-), eIF5 siRNA I (+), or eIF5 siRNA II (+), using eIF5 (D5G9) Rabbit mAb (upper) and GAPDH (D16H11) XP® Rabbit mAb #5174 (lower). The eIF5 (D5G9) Rabbit mAb confirms silencing of eIF5 expression, while the GAPDH (D16H11) XP® Rabbit mAb is used as a loading control. eIF5 (D5G9) Rabbit mAb recognizes endogenous levels of total eIF5 protein. Monoclonal antibody is produced by immunizing animals with a synthetic peptide corresponding to residues near the carboxy terminus of human eIF5 protein. Eukaryotic translation initiation factor 5 (eIF5) is crucial for the assembly of translation initiation complex and plays an important role in protein synthesis (1). eIF5 interacts with the 43S initiation complex to stimulate hydrolysis of GTP bound to eIF2 (1-3). Studies suggest that eIF5 functions as the GTPase-activating protein (GAP) in the hydrolysis of GTP-bound eIF2 (4,5). This hydrolysis leads to the release of initiation factors from the 40S ribosomal subunit, which is a necessary step in the formation of the 80S initiation complex (1). Das, S. and Maitra, U. (2001) Prog Nucleic Acid Res Mol Biol 70, 207-31. Chakrabarti, A. and Maitra, U. (1991) J Biol Chem 266, 14039-45. Asano, K. et al. (2000) Genes Dev 14, 2534-46. Das, S. et al. (2001) J Biol Chem 276, 6720-6. Paulin, F.E. et al. (2001) Curr Biol 11, 55-9.